Inner Walls: Polyester taffeta/no-see-um mesh. No leaking even in heavy thunderstorms. Stays dry pretty well. Good deal of interior space. Has an electrical port, which is a big plus. Sets up within minutes. With two people inside, they can still walk around the tent interior. Rainfly is too close to the door, which may cause flooding of the entry/exit way. Requires a footprint due to the thin floor material. 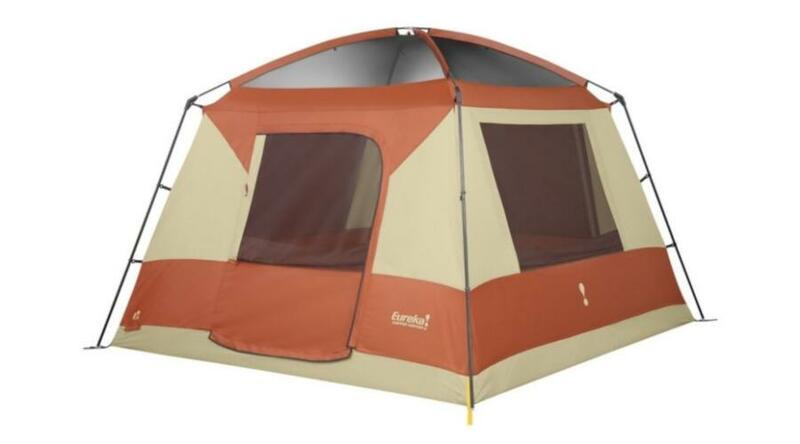 A cabin tent like the Copper Canyon 6 from Eureka is very ideal for both families and groups. This model is tall, wide, and spacious inside, at 10 feet long by 10 feet wide and 7 feet high. It can house a maximum of 6 people. Also, it is designed as a 3-season tent; in other words, the tent is best used in the summer and in warm conditions. Below you can see a list of it's strongest and weakest points. Freestanding. 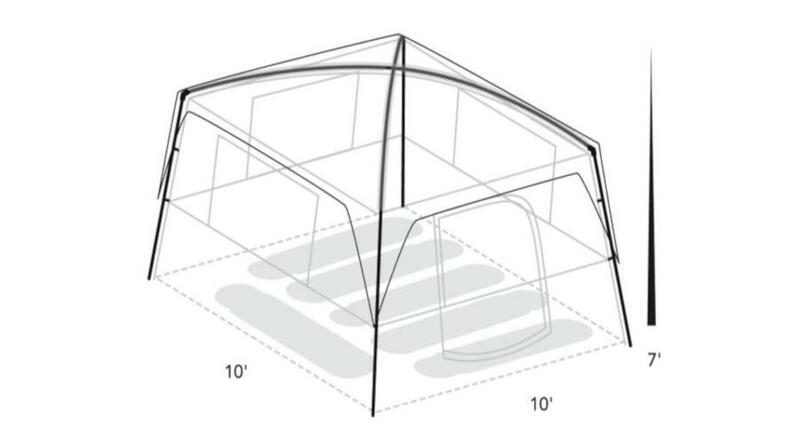 This tent can be pitched on any surface; staking is not strictly required. Though it is always best to stake it to the ground whenever possible so it doesn’t move about. Tall. 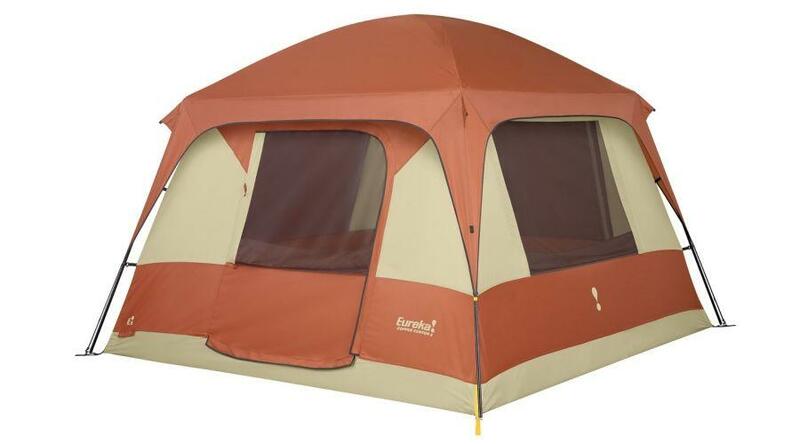 At 7 feet of peak height, the Copper Canyon 6 can accommodate nearly anyone even standing up inside the tent. And when you’re sitting and lying down, the interior feels like an actual room in a house. No one would feel claustrophobic inside it. Wide. The tent is designed as a square: 10 feet by 10 feet, for a total of 100 square feet of floor area. It’s wide enough to house 6 people, as in the advertised capacity. For families camping with kids, the Copper Canyon 6 is a great choice. Roomy. This is a cabin tent; therefore, it has near-vertical walls, maximizing the available space inside. With that, you can actually put in some bunk beds and the tent would still feel like it has ample room. You can even pack in all of your gear inside without sacrificing much comfort. The best part is you can change clothes without having to contort yourself into an uncomfortable position. Sturdy poles. The Copper Canyon 6 uses a combination of steel and fiberglass poles - the steel ones are for the sides, while the fiberglass ones are for the top. Despite the material, the top poles are not brittle at all, as they are thicker than the fiberglass poles from other tents. Overall, they help keep the structure of the tent stable when pitched. Has a gear loft. The Copper Canyon 6 includes a sort of sleeve that can be hung under the ceiling. This is useful for small items you want to keep out of reach, like keys or wallets. Fast setup. Two people can pitch this tent in about ten minutes. It may be huge, but the Copper Canyon 6 isn’t really complicated to prop up. The two top poles are even shock-corded, allowing the segments to be attached to each other a lot more easily. Excellent ventilation. The combination of the wide, all-mesh ceiling and the four large windows allow air to easily flow into and out of the tent. This makes the Copper Canyon 6 a great fit for the summer. Compact. When packed, the entire setup is only 26 x 8 inches. It can fit in an RV, SUV, car, and it’s even possible to take this tent on a motorcycle or bicycle. Take note that it’s 25 pounds though, so it may not be ideal to carry it on any one person’s back. Powered. This tent features an electrical plug so you can juice up devices right inside the tent. This, of course, requires a campsite that has a power outlet. Low price. This tent retails for $289.95 info_outline on Amazon. For a cabin tent of this size, the price is an excellent deal. It’s not too cheap that will make most people doubt the quality, yet not too expensive to turn most people off from buying it. Windcatcher. The near-vertical walls may be good for interior space, but it can get problematic when the wind starts blowing. In particular, pitching the tent under windy conditions can prove annoying. However, once it’s staked down to the ground, the tent stays on securely. Also use the included guylines for the rainfly to make the structure even more stable. No vestibule. 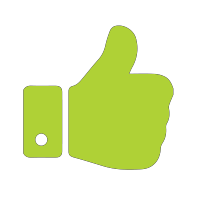 This means that there is no protected space outside the tent to keep shoes, soiled clothes, and backpacks. You’ll have to keep them inside when it’s raining. Only one door. Though the door is big, it’s still a bit disappointing for a tent of this size to only have one door. The opposite side has more than enough space for at least an extra door - even a smaller one. Not enough pockets. The Copper Canyon 6 does have a few pockets, but there are only two of them. There’s a lot more space inside, so there could have easily been a few more pockets. Also, the placement is kind of awkward. The things you keep in the pockets are not within reach while you’re lying down. If you like that convenience, unfortunately, this tent does not offer it. 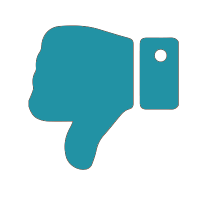 Low waterproofing rating for the rainfly. The rainfly, made of PU-coated polyester, is only rated at 1200 mm. This is lower than most other tents, which have ratings of 1500 mm or higher. Thus, the tent is not adequately protected from heavy rains. However, for light showers, it should not be a problem. Does not keep heat in. The superb ventilation does have a drawback - in cold weather, it’s so easy for frigid air to come through. Therefore, avoid using this tent during cool seasons. Fragile floor. The floor is made of the same thin polyester material as the walls. So it’s best to have at least a tarp or some other footprint under the tent. Unfortunately, the Copper Canyon 6 neither has an included footprint nor one that is specifically designed for this model. The Eureka Copper Canyon 6 works very well for a family with a number of kids, as well as groups of up to 6 grown-ups. The wide area of 100 square feet and the 7 feet of height makes the interior very comfortable to stay in, whether you are lying down, sitting, or even standing. It is a 3-season tent, so it’s not suitable for use all year round. However, such a tradeoff should not be too bad. Not many people would want to go camping in the winter anyway. Last but certainly not least, the $289.95 info_outline price tag is great. This makes the Eureka Copper Canyon 6 great for campers who value space but don’t want to spend too much on a tent.